La selección Alevín de Corea del Norte disputará el 8º Torneo Primer Toque. Será uno de los grandes atractivos de esta edición. La selección alevín de Corea del Norte se encuentra desde hace unos meses en Barcelona, concretamente en la Escuela de la Fundación Marcet. Un programa de formación por un convenio entre la citada entidad catalana y el gobierno Coreano, es el motivo de la estancia de estas jóvenes promesas. Esta Semana Santa tendremos la oportunidad de ver competir a esta selección en la categoría alevín de 2º año. Sin duda será una buena prueba para ellos y un privilegio para el Torneo Primer Toque ya que son jugadores con un gran nivel deportivo y con mucha proyección. Os presentamos a los chicos que están muy ilusionados en vivir esta experiencia. Posted in Senza categoria on gennaio 31, 2014 by calciocorea. Pyongyang, January 28 (KCNA) — Ho Juk San of the DPRK was known as a “machine leg” among the local people for his skilled football techniques. Born in an alien land in Juche 13 (1924), he played football with straw balls in his childhood. He rose to fame as a footballer after Korea’s liberation from Japan’s colonial rule. In February 1949, he joined the football team of the Ministry of National Defence as a forward. In a game against a military football team of the former Soviet Union, Ho Juk San scored a goal with 180 degrees pivoting kick, evoking stormy cheers from audience. After the game, the coach of the Soviet team confessed that Ho’s kick movement was hard to follow even for European football aces. Ho also fully displayed his special techniques in football games at the 2nd World Festival of Youth and Students in August 1949 and other games, being deeply admired as a top scorer. As the Korean War (1950-1953) broke out, he volunteered for military service and served as an officer of the Korean People’s Army before falling in a battle in September 1950. One day, more than 40 years after his death, leader Kim Jong Il recalled Ho Juk San, saying he was a football ace called a “machine leg”. 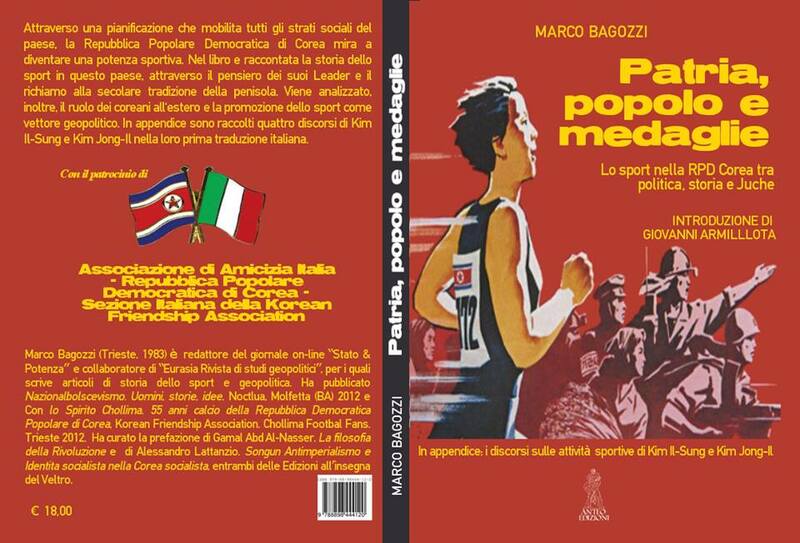 Posted in Senza categoria and tagged ho juk san on gennaio 29, 2014 by calciocorea. Guus Hiddink, the former manager of the South Korean national football team, may visit North Korea. A Unification Ministry official on Friday said Hiddink last month said he would like to see North Korea and asked about the procedure if he was to cross the land border. He has not yet mad an official application. The goal of Hiddink’s visit is to promote sports exchanges with North Korea including building a futsal field and holding futsal matches in the North. 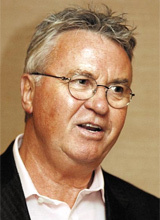 Hiddink has built several futsal fields in South Korea through the Guus Hiddink Foundation. Since he is not a South Korean citizen, he does not need authorization from the South Korean government to visit North Korea through China, but approval by the South Korean government is required if he intends to cross the border from South Korea. The ministry official said Hiddink did not offer a detailed schedule. “The government’s policy is to allow social and cultural exchanges with North Korea, so once we receive the application, we’ll review and approve it,” the official added. Posted in Senza categoria on gennaio 27, 2014 by calciocorea. The former manager of South Korea’s national football team is planning a trip to North Korea to help build a futsal stadium there, South Korea’s Unification Ministry spokesman said Friday. Kim Eui Do told a press briefing that Guus Hiddink, who led South Korea to the 2002 World Cup semifinals, proposed the idea to the South Korean government in late 2013. According to Kim, Dutchman Hiddink said he is hoping to send materials needed for the stadium through the inter-Korean border, with the government currently reviewing his request. Hiddink has already helped South Korea build 11 futsal stadiums for visually impaired players, Yonhap News Agency reported. Futsal is played indoors with five players a side on a smaller pitch than football. Posted in Senza categoria on gennaio 24, 2014 by calciocorea. It’s not often that you end up talking to a North Korean in India, more so a professional footballer plying his trade for faraway Shillong Lajong FC (football club) in the I-League. 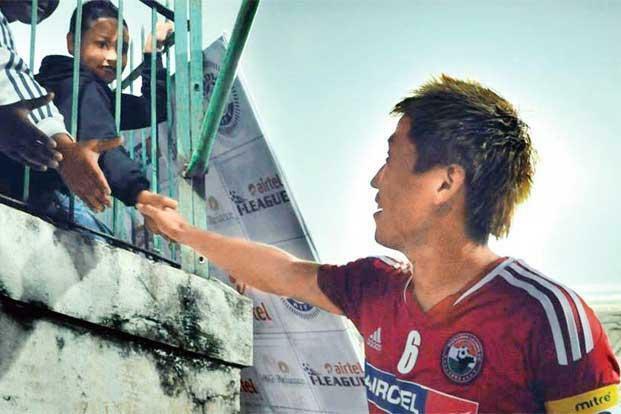 Minchol Son, a former North Korea under-23 international player, was signed up by Shillong Lajong in June 2012 in a short-term deal, before his performance earned him a contract with the club. Today, the 27-year-old, 5ft, 10 inches central defender is leading Lajong in the I-League and hopes that his performance will lead him to his dream—representing North Korea’s senior team in international football. Given that Son, who has been living in Japan, primarily played in that country’s regional leagues, the lure of a top national-level league (division one in the pyramid) in India was too much to resist. And Lajong, with its fanatical fan base, proved an ideal fit. “When my agent (Libero Sports) approached me with an offer to join Lajong, I decided to take it up,” says Son. The I-League may not be the strongest in Asia, but it offers someone with international ambitions a chance to get noticed purely by playing week in and week out, something Son missed out on in Japan. In the Group C matches in the ongoing Federation Cup, Lajong beat Salgaocar Football Club 4-0 in their opener and were thrashed 6-0 by Mohun Bagan Athletic Club in their second game. Son played in the midfield during Bagan’s thrashing of Lajong on 18 January. The desire to represent North Korea is rather interesting, especially when you look at Son’s origins—he wasn’t born in North Korea and lived practically all his life in Japan before signing up for Lajong. Given that North Korea and Japan do not have diplomatic relations, the case gets curiouser. Son is a Zainichi Chosenjin (a Japan-born North Korean). His grandfather moved to Kyoto, Japan, during World War II and met his grandmother, who was from Osaka; he settled in his adopted homeland. Born in Kyoto, Son attended the Chongryon-established (the de facto North Korean embassy in Japan) Korea University in Tokyo. “I began playing football at a very young age in Japan. It was very popular there and I thought I could do well in the sport,” says Son. He played for FC Ryukyu in the third tier of the Japanese Football League before moving to Tokyo-based FC Korea—a club closely associated with his university’s sports programme and the Chongryon, until Lajong came calling. Interestingly, Son’s girlfriend is a Zainichi Kankokujin (a Japan-born South Korean). Son never considered playing in North Korea’s Highest Class Football League, which he describes as an “amateur” league without foreign players. “In Japan, there are many foreign players from Spain and Italy who come and play there. But in Korea, the situation is different. The league is good, but competition is limited,” he says. Son has been to Pyongyang at least six times in his career; the last of these trips was seven years ago, when he was a part of the North Korean under-23 Olympic probables. He has trained and played in the Kim Il-Sung stadium in Pyongyang, and fondly remembers the time he trained and later played in a friendly in front of the “Dear Leader”, Kim Jong-Il. Posted in Senza categoria and tagged Son Min-Chol on gennaio 23, 2014 by calciocorea. Posted in Senza categoria on gennaio 23, 2014 by calciocorea. 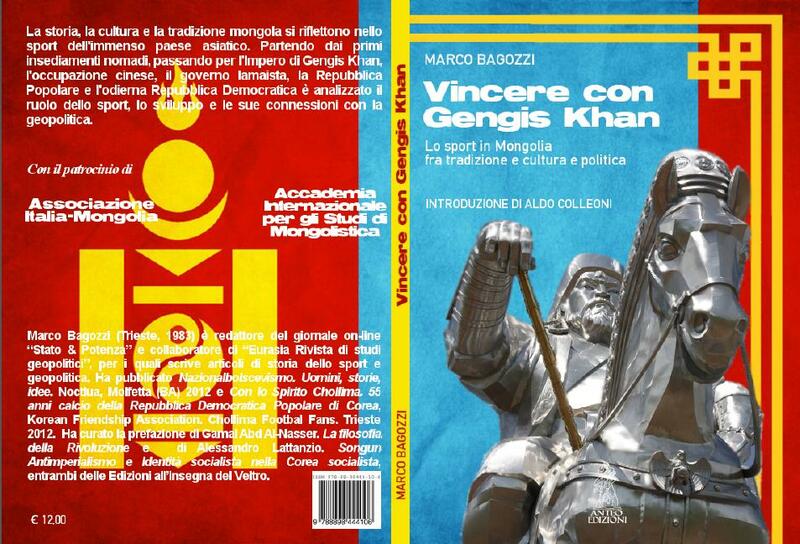 Spazio anche ai rapporti mongolo-coreani. Posted in Senza categoria on gennaio 21, 2014 by calciocorea. Posted in Senza categoria and tagged nazionale femminile on gennaio 20, 2014 by calciocorea. Pyongyang, January 20 (KCNA) — Footballers of the DPRK will play various international matches this year. In July boys will play matches for berth for the 2015 AFC U-22 Championship. They will also participate in AFC U-14, U-16 and U-19 championships scheduled to be held in Iran, Thailand and Myanmar in August, September and October. Men and women football teams will play matches of the 2014 Asian Games from Sep. 19 to Oct. 4. Women footballers will also participate in the 2014 FIFA U-17, U-20 Women World Cups which will begin in Costa Rica from mid-March and in Canada from early August. Posted in Senza categoria on gennaio 20, 2014 by calciocorea.